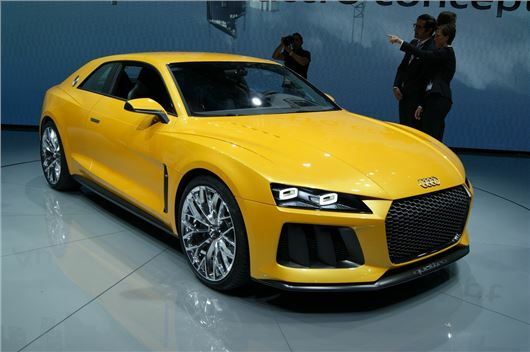 Audi has launched its Sport quattro concept at the Frankfurt Motor Show. A conceptual successor to the 1980s rally and road car, the Sport quattro features styling cues that give a nod to the original, but with modern technology and performance. Power comes from a 560PS V8 linked to a plug-in hybrid system, making for total peak power of 700PS and 800Nm of torque. That makes for impressive performance – 062mph takes 3.7 seconds and top speed is 189mph. However thanks to the plug-in hybrid powertrain the combined cycle economy figure is 113mpg with emissions of 59g/km. It’s been designed with three driving modes – it can operate as an EV or a hybrid for city centre or everyday driving, or Sport mode can be engaged to five the maximum power and performance from both the engine and the electric motor. In the cabin is a fully digital instrument display which does all of the usual things like showing the cars speed, along with extra features like 3D displays, lap timers and even in depth information about specific racing circuits. There’s an abundance of carbon fibre plus bucket seats and a new multi-function steering wheel which shows of some of the features set to appear on future production models. Similarly there are Matrix all-LED headlights which, despite appearing on a concept car, are to appear in production form on the Audi A8 from the end of this year.